Relevant, refreshing and real, Life You're Living showcases Jesse's unique ability to inspire listeners with his music. Life You're Living is a musical testament to how we should live as Christians. Inspired by an encounter with his own humanity, the songs remind us that despite our individual brokenness, we're constantly surrounded by family, friends and a larger community of faith, all bound together in our common need for God. Renowned producer Jeff Thomas expertly matches the right arrangements to the one voice he's been wanting to get ahold of: Jesse's. Featuring songs co-written with Sarah Hart, Bob Halligan Jr (Ceili Rain) and Matt Maher, Life You're Living is packed with liturgically sound praise and worship titles. Adding instrumentation layer by layer, "Bread of Heaven" dynamically builds into a moving plea to God. "Falling Into You" sports a head-bobbing groove and harmonies from Audrey Assad that just seem to cling to Jesse's lead vocal. Sarah Hart joins Jesse on "Give Us Your Peace," drawing listeners in to lose themselves in simple prayer. "Shelter" is a joyful jam. And the inspiring "How We Talk About It" challenges us to display "a love that lives in our actions, not just how we talk about it." New recordings of "Glory to God Most High" and "Open My Eyes"
Life You're Living features new recordings of two songs familiar to longtime fans of Jesse's music. "Glory to God Most High" gets updated with bluesy guitar riffs and extended versions of verses two and three that breathe new life into a soulful classic. Warmly wrapped in the full string arrangement the song has been aching for, "Open My Eyes" will also open listeners' ears... as if they're hearing this familiar favorite for the first time. What prolific composers such as Dan Schutte, Bob Hurd and Christopher Walker have been doing for years, Jesse Manibusan is beginning to do for a new generation of worshipers: provide a defining library of songs with staying power. 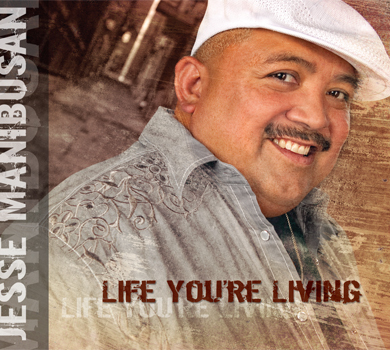 Relevant, refreshing and real, Life You're Living is a record that showcases Jesse's ability to inspire through song.